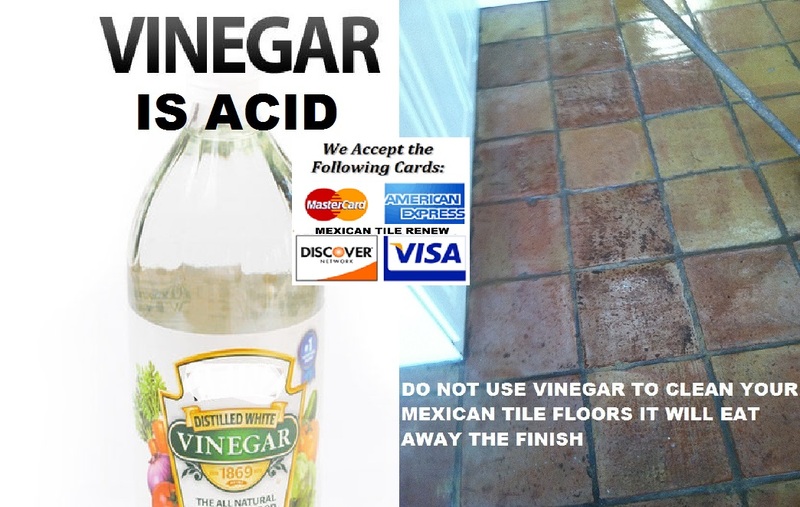 MEXICAN TILE REFINISH : 'Mexican Tile Renew' Upkeep Tips: Do Not Use Painter's Tape or Vinegar or Rubber Pads Under Area Rugs on Mexican/Saltillo Tile. 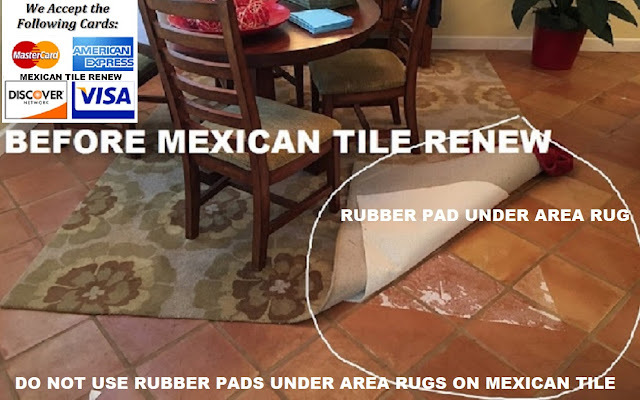 'Mexican Tile Renew' Upkeep Tips: Do Not Use Painter's Tape or Vinegar or Rubber Pads Under Area Rugs on Mexican/Saltillo Tile. 'Mexican Tile Renew' Upkeep Tips: Do Not Use Painter's Tape or Vinegar or Rubber Pads Under Area Rugs on Mexican/Saltillo Tile. Mexican Tile aka Saltillo Tile flooring and all other types clay tile should never have painter's tape or rubber pads applied to them. Most times painters and remodeling contractors or flood restoration tradesmen don’t seem to be aware that any type of tape on Mexican tile or other clay tile can cause severe damage to the clay tile finish. Any type of tape, even blue or green sensitive surface tape will pull up the sealer finish and leave a 3 inch wide mark. 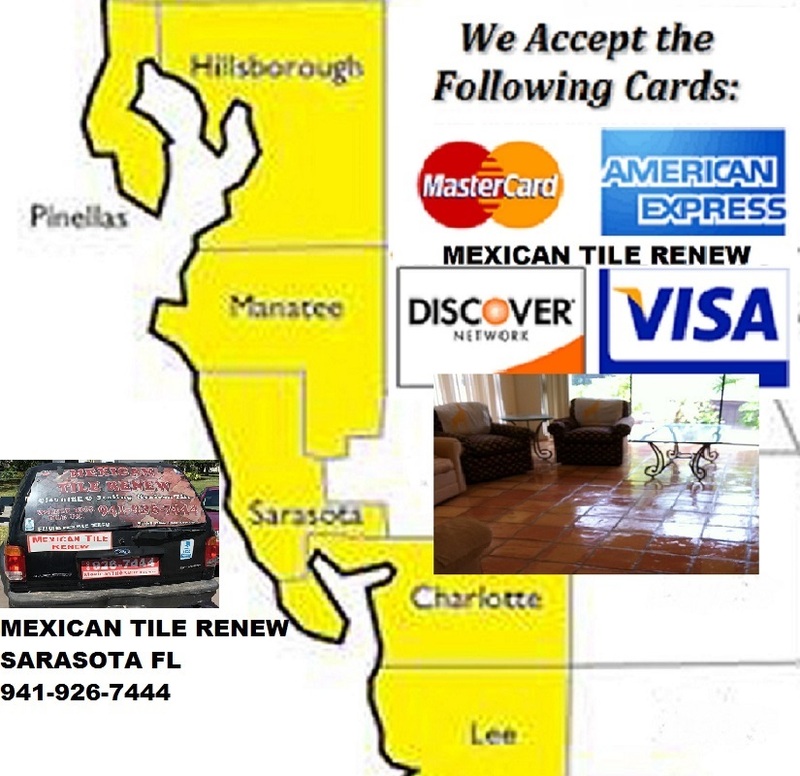 BETTER CALL VEL AT MEXICAN TILE RENEW 941-926-7444. The damage to the Mexican Tile aka Saltillo Tile flooring is caused by the fact that the polymer in the painter's tape and the polymer in the sealer are closely related. The close match creates a tremendous bond to the tile sealer. When the tape is pulled up the sealer is pulled up along with the tape. Even worse is that the Mexican tile sealer has a tremendous bond to the crust of the tile. BETTER CALL VEL AT MEXICAN TILE RENEW 941-926-7444. When the Mexican tile sealer is pulled with the painter's tape it usually also lifts off the crust of the tile in the configuration of the straight edges of the tape. The tradesman who applies this tape to your Mexican tile is usually trying to protect your tile from damage during a painting or restoration process, however the end result is damage as opposed to protection. 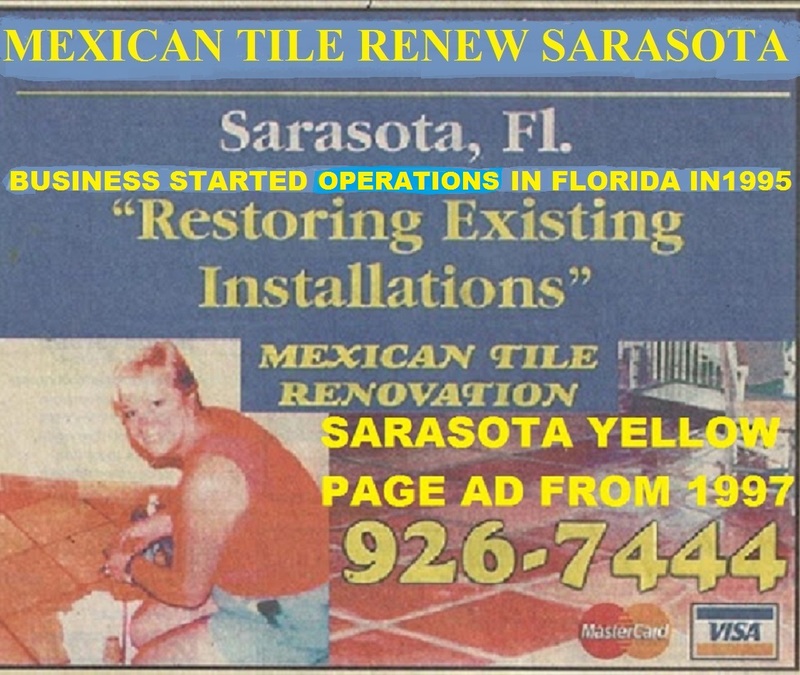 BETTER CALL VEL AT MEXICAN TILE RENEW 941-926-7444. 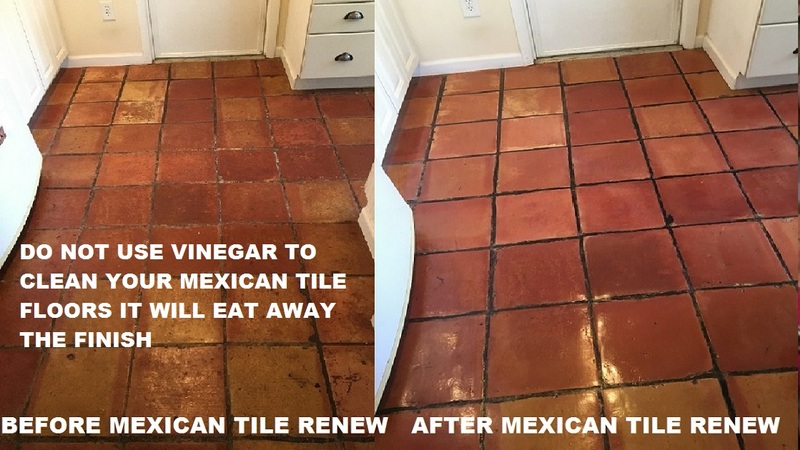 PAINTER'S TAPE, RUBBER PADS AND VINEGAR WILL ALL RUIN THE FINISH ON YOUR MEXICAN TILE FLOOR, MEXICAN TILE RENEW CAN FIX IT. 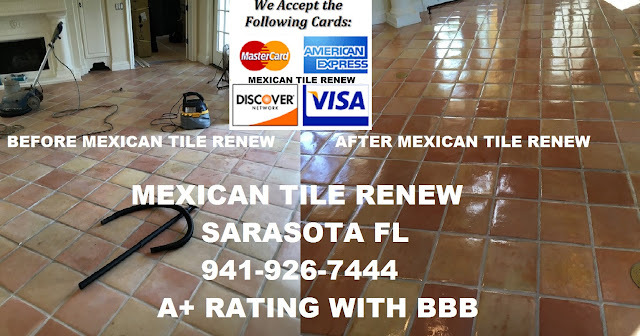 Mexican Tile Renew project in a Home In Sarasota Fl with Rubber Pad Stuck to The Mexican Tile Floor, Mexican Tile Renew Fort Myers to Sarasota To St Pete. 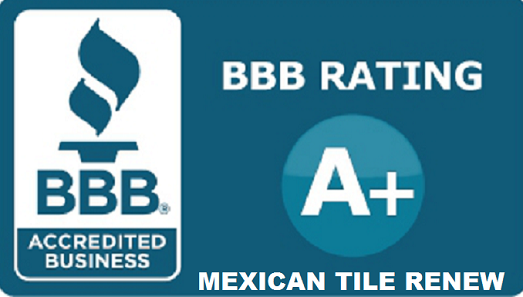 BETTER CALL VEL AT MEXICAN TILE RENEW 941-926-7444. Mexican Tile Floor Care: Do Not use Vinegar to Clean Your Mexican Tile Floor it Will Ruin the Finish. Vinegar is an acid. Proper weekly maintenance is just as important as getting the right installer in order to extend the life of your Mexican Saltillo tile. Labels: 'Mexican Tile Renew' Upkeep Tips: Do Not Use Painter's Tape or Vinegar or Rubber Pads Under Area Rugs on Mexican/Saltillo Tile.